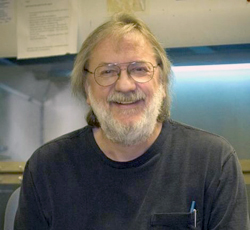 Dr. James Pipas is the Herbert W. and Grace Boyer Chair in Molecular Biology and Professor of Biological Sciences at the University of Pittsburgh. He received his PhD in Molecular Biophysics from Florida State University and completed his postdoctoral training at Baylor College and the John Hopkins School of Medicine. Jim has been a faculty member in the Department of Biological Sciences at the University of Pittsburgh now for over 30 years. Jim is here with us today to tell us all about his journey through life and science. Outside of science, Jim’s passions include entertaining and exploring. He composes music, sings, and produces shows with his brother all over the world. The other activity that brings him great joy is immersing himself in nature in remote forests and mountains. Jim’s lab studies how viruses work, how they interact with us, and where they come from. They also use viruses as tools to understand how our own biology works. For example, they study viruses that cause cancer. Spend as much time as you can with highly motivated individuals. During his childhood, Jim was definitely a science enthusiast. He remembers the lab in his basement where he performed chemistry experiments and occasionally kept snakes and frogs (to his mother’s horror). Jim’s curiosity was supported by his family, and his grandmother was always happy to bring him books on the subjects he wanted to learn more about. Right now they are struggling with how to study very rare viral events. In particular, they are examining a type of virus that is responsible for much of the world’s food-borne illnesses. These viruses are challenging to study because they are constantly mutating and changing. They initially struggled to find the one virus sequence of interest amongst all of the sequences in their samples, but may have found a method that will provide the solution. For viruses that cause cancer, much of the emphasis is on the genetic mutations that lead to generation of tumors. However, Jim’s lab was able to show with a particular viral protein that it’s not just the genetics, but also where the virus is acting that matters. Specifically, viral infection of certain types of cells causes tumorigenesis, but the same infection of other cell types does not. Jim’s favorite trip occurred in 1989 and was dubbed “Around the World for Science and Music”. During a sabbatical, Jim and his brother went on a four and a half month trip around the world through Finland, Estonia, the Soviet Union, China, Thailand, Indonesia, Australia, New Zealand, and more! He was giving lectures, his brother was doing concerts, and they worked together on some performances as well. He was particularly impressed by the fascinating biology, beauty, and remoteness of Siberia. In one of the lab groups Jim worked in, the students and postdocs would go out together and try to do something none of them were good at. This included white water canoeing and kayaking trips, as well as playing tricks on each other. Stay low and bend your knees – this way you’ll always be prepared for anything that you might encounter. Also, in life you should define your dreams, create a plan to achieve your dreams, perform frequent reality checks, have fun, and go for it! Jim’s research focuses on various aspects of virology. They utilize SV40 as a model system for understanding molecular events involved in viral productive infection and tumorigenicity. Their studies have focused on the virus-encoded master regulatory protein, large T antigen. Large T antigen controls several aspects of viral infection including DNA replication, transcription and virion assembly. In addition, T antigen is necessary, and in most cases, sufficient for SV40-mediated tumorigenesis. Another area of their work focuses on virus discovery and functional viral metagenomics. All viruses encode proteins that are involved in replicating the viral nucleic acid or in the assembly of progeny virions. In addition, viruses must encode activities that block or diminish host defenses against infection. This latter group of proteins is known as HIPs (Host Interactive Proteins). They have developed computational methods for identifying HIPs and are now in the process of applying these methods to all known viruses that infect multicellular organisms. Their strategy is to develop a retrovirus library that expresses viral HIPs and to use the library in high throughput screens to identify viral proteins that modulate cell proliferation, death or the innate immune response. They then use a combination of proteomics and genetics to identify the cellular target and pathway that is altered. Given that there are over 50,000 virus-encoded proteins listed in Genbank and that fewer than 5% are of known function, they expect these HIP screens will identify novel cellular pathways and regulatory proteins.